Several ancient Roman chroniclers say that on this date in 312, the emperor Constantine had a vision that marked the beginning of his conversion to Christianity. Modern historians doubt that Constantine actually became a Christian convert in the strict sense, but, rather, that he added Christianity to his bag of beliefs, and, in the process, halted the persecution of Christians. I covered the whole process of Constantine’s change of attitude towards Christians here: http://www.bookofdaystales.com/edict-of-milan/ In this post I want to focus solely on the vision which occurred on the night before the Battle of the Milvian Bridge between Constantine and Maxentius on 28th October 312. It takes its name from the Milvian Bridge, an important route over the Tiber. Constantine won the battle and started him on the path of ending a period of multiple emperors and becoming the sole ruler of the Roman Empire. 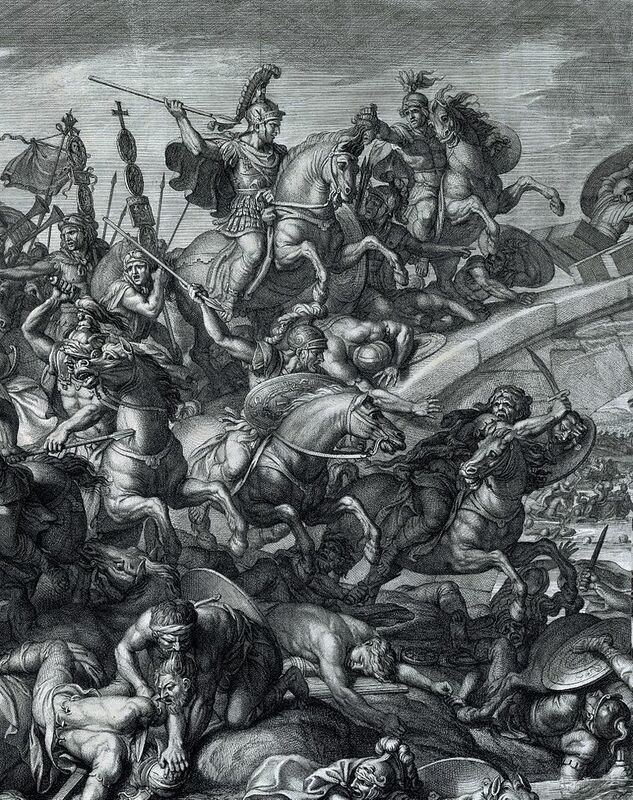 It is commonly understood that on the evening of 27th October with the armies preparing for battle, Constantine had a vision which led him to fight under the protection of the Christian God. Some details of that vision, however, differ between the sources reporting it. Lactantius states that, during the night before the battle, Constantine was commanded in a dream to “delineate the heavenly sign on the shields of his soldiers” (On the Deaths of the Persecutors 44.5). He followed the commands of his dream and marked the shields with a sign “denoting Christ”. Lactantius describes that sign as a “staurogram”, or a Latin cross with its upper end rounded in a P-like fashion. There is no certain evidence that Constantine ever used that sign, as opposed to the better-known Chi-Rho sign described by Eusebius. From Eusebius, two accounts of the battle survive. The first, shorter, one in the Ecclesiastical History makes the claim that the Christian God helped Constantine win the battle, but does not mention any vision. In his later Life of Constantine, Eusebius gives a detailed account of a vision and stresses that he had heard the story from Constantine himself. According to this version, Constantine with his army was marching (Eusebius does not specify the actual location of the event, but it clearly is not in the camp at Rome), when he looked up to the sun and saw a cross of light above it, and with it the Greek words “Εν Τούτῳ Νίκα”, usually translated into Latin as “in hoc signo vinces”. The literal meaning of the phrase in Greek is “in this, conquer” while in Latin it is “in this sign, you shall conquer.” At first he was unsure of the meaning of the apparition, but during the night he had a dream in which Christ explained to him that he should use the sign against his enemies. 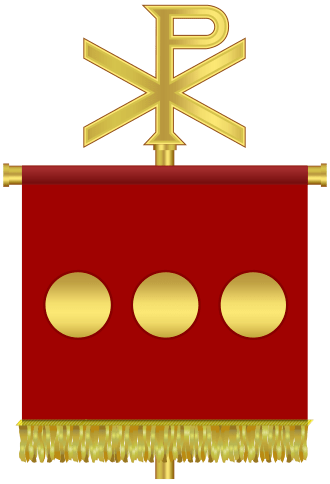 Eusebius then continues to describe the Labarum, the military standard used by Constantine in his later wars against Licinius, showing the Chi-Rho sign. The accounts of the two contemporary authors, though not entirely consistent, have been merged into a popular notion of Constantine seeing the Chi-Rho sign on the evening before the battle. Both authors agree that the sign was not widely understood to denote Christ (although among the Christians, it was already being used in the catacombs along with other special symbols to mark and/or decorate Christian tombs). 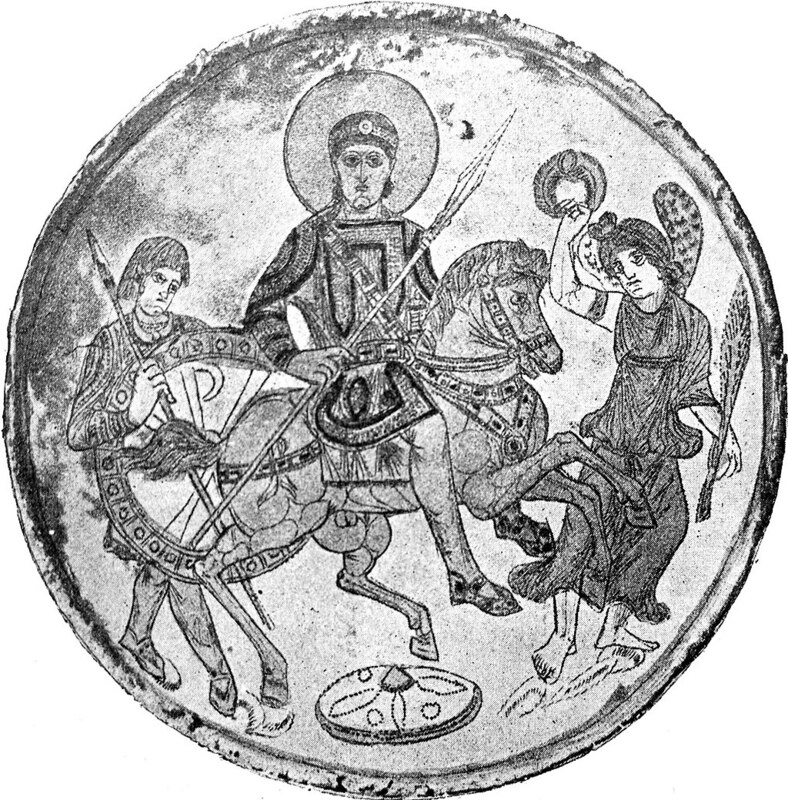 Its first imperial appearance is on a Constantinian silver coin from c. 317, which proves that Constantine did use the sign at that time, though not very prominently. He made more extensive use of the Chi-Rho and the Labarum later, during the conflict with Licinius. Some historians have considered the vision in a solar context (e.g. 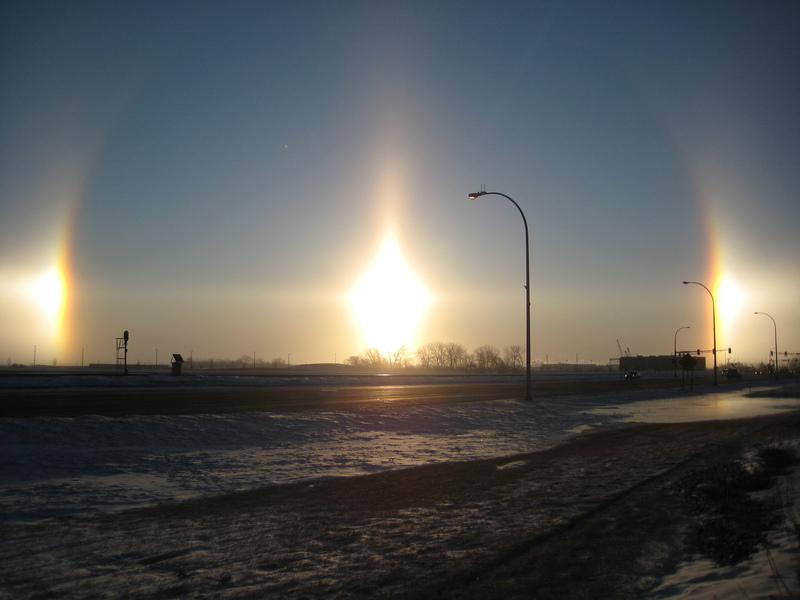 as a sun dog), which may have preceded the Christian beliefs later expressed by Constantine. Coins of Constantine depicting him as the companion of a solar deity were minted as late as 313, the year following the battle. The solar deity Sol Invictus is often pictured with a nimbus or halo. Various emperors portrayed Sol Invictus on their official coinage, with a wide range of legends, only a few of which incorporated the epithet invictus, such as the legend SOLI INVICTO COMITI, claiming the Unconquered Sun as a companion to the emperor, used with particular frequency by Constantine. Constantine’s official coinage continues to bear images of Sol until 325/6. A solidus of Constantine as well as a gold medallion from his reign depict the Emperor’s bust in profile jugate with Sol Invictus, with the legend INVICTUS CONSTANTINUS. The official cults of Sol Invictus and Sol Invictus Mithras were popular amongst the soldiers of the Roman Army. Statuettes of Sol Invictus, carried by the standard-bearers, appear in three places in reliefs on the Arch of Constantine. Constantine’s triumphal arch was carefully positioned to align with the colossal statue of Sol by the Colosseum, so that Sol formed the dominant backdrop when seen from the direction of the main approach towards the arch. Time for another recipe from Apicius. This time sala cattabia apiciana or aspic in the style of Apicius. The recipe comes from the section labeled Odds and Ends. I include it more for interest, and perhaps to get some ideas, rather than because I think you might actually make it. I’ve given my loose translation only, but you could check out the original online if you know a bit of Latin and Italian. It is in what is called vulgar Latin, the street language of the day, which is surprisingly (or unsurprisingly) like Italian. The recipe calls for bread from Picenum, which was especially favored. It was made from alica, a valued form of coarsely-ground emmer wheat which, made a highly prized bread with a rough texture. Both the poet Martial and Pliny the Elder sing the bread’s praises. The first sentence describes making a dressing that does not go in the mould, but is added as a garnish at the end. 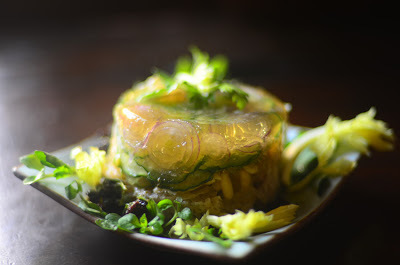 The instructions do not say that after chilling the aspic and letting it set, it should be unmoulded before adding the sauce. Put celery seed, dried pennyroyal, dried mint, ginger, fresh coriander, seedless raisins, honey, vinegar, oil and wine into a mortar and crush them together. Place three pieces of Picenum bread in a mould, layered with pieces of chicken, calf or lamb sweetbreads, Vestinum cheese, pine nuts, pickled cucumbers, and finely chopped. Cover with rich aspic. Bury the mould in snow up to the rim. Sprinkle with the prepared sauce and serve.